Shahzoob Bilal Chundrigar is an Engineer with the Information and Communications Research Laboratories in the Industrial Technology Research Institute, Hsinchu, Taiwan (R.O.C). He has been involved in several European Union research projects, such as the fifth-generation (5G)-Crosshaul and 5G-Transformer Projects. He is also involved in the first ever European–Taiwan collaboration project, 5G Convergent Virtualised Radio Access Network Living at the Edge. His current research interests include 5G wireless mobile communications, including mobile edge computing, high-speed networks, cloud computing involving software-defined network, and network function virtualization technologies. 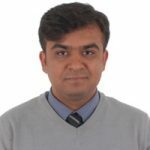 Prior to joining ITRI, Shahzoob Bilal was a Senior Consultant at 3DResults and Engineer at Myson, Engineering Services. Currently he is leading the Demonstration and Trails of the 5G-CORAL project.